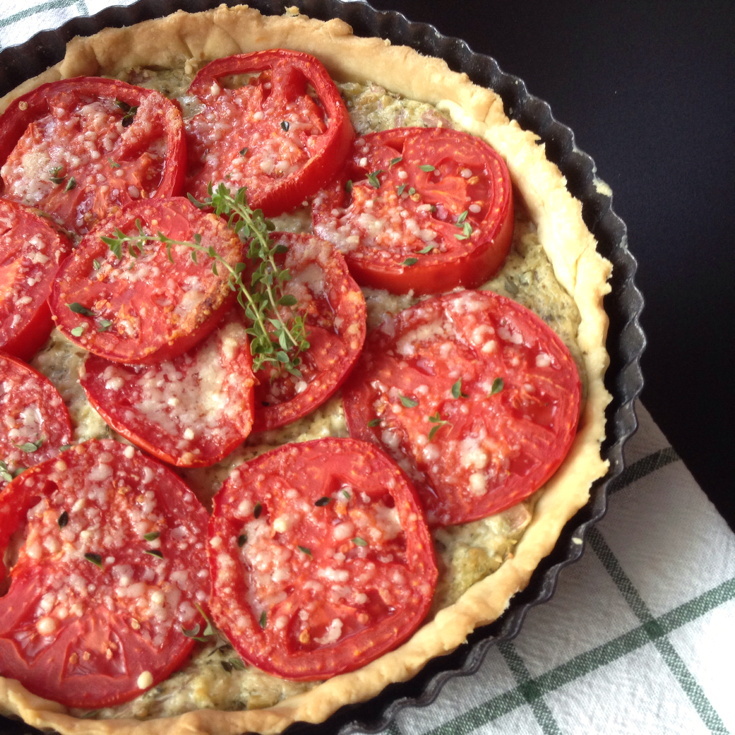 Fresh Tomato Tart - Get the Good Stuff! When summer's tomatoes are at their ripest, make this fresh tomato tart. Crust, herbed cheese, and tomatoes make a splendidly tasty combination. The crust can be made ahead of time and chilled. Make the filling while the crust bakes "blind", then spread it in the warm pastry shell. Top with slices of the ripest tomatoes you can find, and blast briefly in a hot oven to finish it off. This tart makes a light lunch, a side dish, an appetizer ... it's the best. This fresh tomato tart may seem complicated, and the recipe is a bit long – but don’t worry, it’s only three simple parts: the crust, the filling, and the tomatoes. The text is long because I carefully explain how to make the crust – if you’re used to making pastry, you’ll breeze by that. And if you’re not used to pastry, you’ll learn why people say “as easy as pie”. Making pie crust is a lot easier than you might think. You can make the crust ahead of time, or even use a ready-made crust, I won’t tell. The filling goes together quickly. Give this a try, and make up your own variations. When I make this tart in my own kitchen, I like to slice the tomatoes and start them draining, then mix the pastry dough and start it blind-baking, and while the tart shell cooks, I cook the vegetables and mix the filling. When the cooked tart crust is out of the oven, the filling is ready to go in, the tomatoes ready to be placed on the top, and then the tart goes in for its final blaze of heat. Start by preheating the oven to 325˚F. We’ll make a simple 3-2-1 pastry (pâte brisée). Mix the flour and salt together. I use a food processor, so stick them in and pulse it once or twice. Add the chunks of very cold butter, pulse again 7-10 times, until the mixture looks like coarse meal, with pieces no larger than small peas. (If you prefer, work the butter into the flour/salt mixture with your fingers or a pastry blender.) Add ice water, 1 tablespoon at a time, pulsing until only the mixture begins to clump together. Remove from the food processor, knead once or twice on a floured board, and shape into a disk. At this point, you may wrap and refrigerate the dough for a day or two. You may also go right ahead with rolling it out, if you’re in a hurry. To prepare the crust if it has been chilled: take the pastry dough out of the refrigerator and unwrap it. Use your rolling pin to press down on the pastry, making little grooves, then proceed to roll the pastry as below. Dust your work surface lightly with flour, and place the pastry disk in the center. Sprinkle the top surface of the pastry with a little flour as well. Turn the pastry 90 degrees every so often to keep a round shape, and keep pressing until the disk is about twice its original diameter, when you can begin to roll. Roll out the pastry, moving the pin back and forth only. Turn the dough 90 degrees every so often, to maintain a round shape. When the dough is about 1½ inches larger than your tart pan, carefully lift the pastry and place it in the pan. Lift the edges, and carefully tamp the pastry into the pan, taking care not to make any holes in it. Press the pastry right up the sides, and trim the top edges even with the top of the pan. Preheat the oven to 325˚F if you haven’t done that already. To make a baked tart shell with no bubbling, you’ll need to use pie weights. Take a piece of aluminum foil and press it onto the raw crust. Weight the foil using pie weights, dried beans, or uncooked rice. Make sure the weights cover the entire bottom of the crust. Bake the weighted tart shell in a preheated 325˚ oven for 20-25 minutes, then check to see if the crust is ready. Pull up one corner of the foil. If the foil sticks, the dough isn’t dry enough to remove it, so return it to the oven and check in 2-3 more minutes. When the crust is dry enough to remove the foil easily, carefully lift off the foil with the weights and return the crust to the oven until it is fully baked and golden brown, about 15 minutes more. Once golden brown, pull the tart shell from the oven and place on a rack to cool. While the crust is baking, slice the tomatoes crosswise into thick quarter-inch slices. It’s important to take some of the liquid away, so put them on a triple-thickness of paper towels (or a cotton tea towel). Sprinkle lightly with salt, then place more towels on top. Let these tomatoes stand, draining some of their liquid into the towels, while you prepare the filling. Heat a skillet over medium heat, and melt the butter. Sauté the onion, leek, and green onions, stirring every so often, until they are cooked through and just starting to brown. Remove from the heat and put in a bowl. Add the garlic-herb cheese, and mix well to combine. Add pesto, if you’re using it, and most of the grated cheese. Reserve a bit of the cheese to sprinkle on top of the tart. Turn oven temperature to 425˚F. Spread the filling in the tart crust, making it as even as you reasonably can. Lay drained tomato slices on top, overlapping them only slightly. Sprinkle with the remaining grated cheese. Bake at 425˚F about 15 minutes, until the filling is hot and the edges of the tomatoes are just beginning to brown. Let stand at least 10 minutes so that the filling firms up a bit. Sprinkle with some fresh herbs, and serve. This is also good at room temperature – it’s a very forgiving tart.